In 1994, there were only 1,755 known farmers markets in the United States. As of 2018, there were 8,760. That growth, which has been increasing steadily, is proof that farmers markets are not only thriving but that people want more of them. Food entrepreneurs have been known to launch their products at farmer's markets—everyone from bakers to fudge makers to artisanal jam makers started by selling at farmers markets. There are websites out there like Amazon and Etsy that make it easy for you to e-tail your products, but the word-of-mouth capabilities of farmers markets are not to be ignored. In fact, you can pair your offline efforts, like hosting a booth, with your online efforts, like Twitter and Facebook. Social media has been a significant factor in most small businesses that have gotten any kind of viral promotion. If it's your first time selling at the farmer's market, start bragging. Use Facebook, Yelp, and Meetup to launch community events that can be shared. Offer a volume discount to anyone who mentions your online invite. 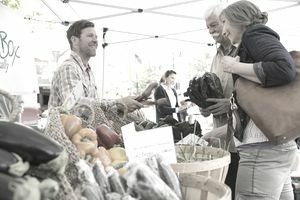 Use Twitter and Facebook to let customers know what farmers market locations you are at. Since most foodpreneurs hop from farmers market to farmers market, it's hard for fans and followers to keep up without real-time updates. Use Instagram to take mouth-watering photos of your food products on display at your booth. Also, get out from behind the Instagram and let someone else take a photo of you with your creations. Once they bring your snack home, they're going to want more, right? Give them a take-home card with every purchase (or put a sticker on your product) that tells them how to get in touch, what your Facebook URL is, and how to follow you on Twitter. There are lots of other creative things you can do, like setting up an iPad for display that gets them to sign up for your email list on the spot. People love to take photos and share them too, so make sure your labeling is prominent, clear and legible. Label everything you're selling by name, with ingredients, and with a price tag. Make a sign that tells people about you, like whether you're organic, vegan, or refuse to work with pesticides too. Heck, add your @username or a #hashtag to your label. Give customers ideas about how to use your products. If you want to attract food bloggers, give away recipes for how to incorporate your food product. On that note, send samples to local bloggers and invite them to your booth! Try not to sell yourself short by haggling with customers; the last customer who paid full price wouldn't appreciate it. You can always lower your prices, but it's hard to raise them! Social media can make your prices very public, very quickly. The food business requires a lot of word-of-mouth marketing, and there's no better vehicle for generating traffic and sales than a combination of social media and in-person tasting. Once you can convince a few socially-savvy customers to tweet about your delicious treats, the community will start coming in just for you.